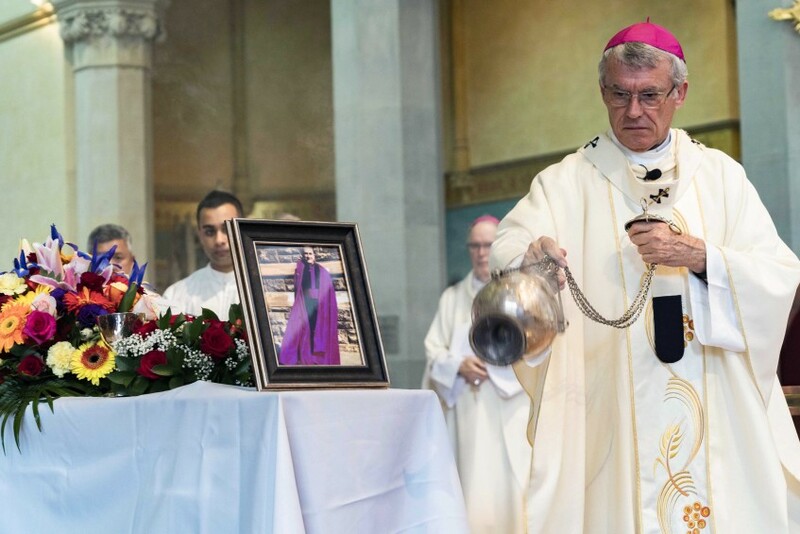 Archbishop Timothy Costelloe SDB blessing the coffin of Monsignor Peter McCrann, who died on 17 February. Photo: Feby Plando. Archbishop Timothy Costelloe SDB celebrated the funeral Mass with concelebrants Auxiliary Bishop Donald Sproxton, Emeritus Archbishop Barry Hickey, Cathedral Dean Fr Sean Fernandez, Geraldton Emeritus Bishop Justin Bianchini, and Fr Brian McKenna, together with other clergy from the Archdiocese of Perth. 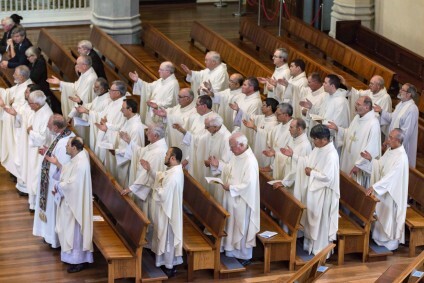 In his welcome address for the funeral Mass, Archbishop Costelloe acknowledged the 62-year contribution of Mgr McCrann as a true servant of the Lord. 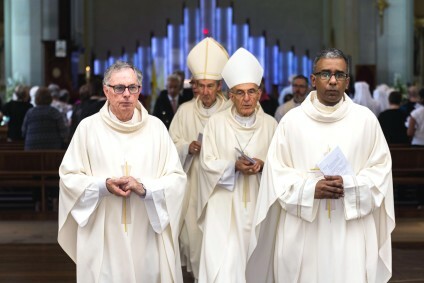 “We thank God for the gift that he has been for so many people throughout the Archdiocese for all these years, praying that the Lord will welcome him into the joy of His kingdom,” Archbishop Costelloe said. Family members of Mgr McCrann bring forward the offertory at the funeral Mass of Mgr McCrann, who died on 17 February at the age of 95. Photo: Matthew Lau. 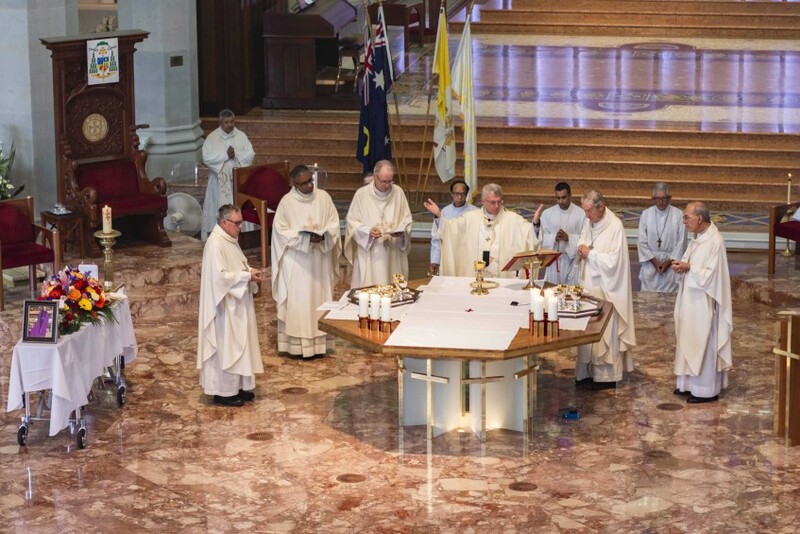 After the introductory rite, representatives from the Knights of the Southern Cross, who Mgr McCrann served as State Chaplain of the Order from 1992 to 2005, assisted with the placing of the pall. The placing of Christian symbols – which included a medal presented to Mgr McCrann by Pope Benedict for his Golden Jubilee of Priesthood and a plaque presented by Archbishop Costelloe in 2017 to commemorate Mgr McCrann’s 60 years of priesthood – were placed on the casket along with Mgr McCrann’s priestly stole and chalice. Several clergy members exiting the St Mary’s Cathedral after the funeral Mass of Mgr McCrann, who died on 17 February, aged 95. Photo: Matthew Lau. Emeritus Archbishop Hickey gave the homily, relating the readings of the day to the life of Mgr McCrann. “The first reading speaks of the priesthood of Melchizedek, who was the King of Salem,” Emeritus Archbishop Hickey stated. 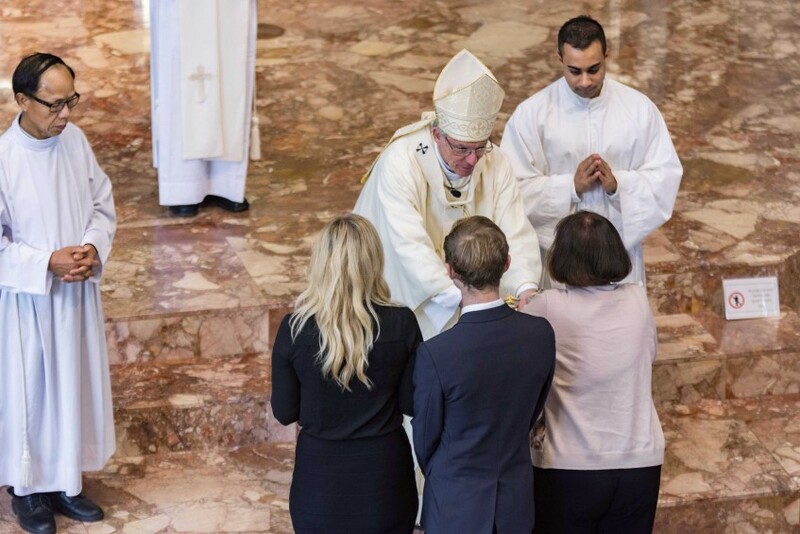 “Mgr Peter received his chair of priesthood at his ordination at Mass, through the symbol of bread and wine – and those who knew Monsignor would know how faithful he was to God and how important the Mass was in his daily life. “The second reading from the letter of Corinthians speaks of all the gifts that have been poured out on the Church. Great gifts that help the Church and its community grow in spirit,” Emeritus Archbishop Hickey added. Emeritus Archbishop Hickey ended his homily by thanking those who spent time with Mgr McCrann and cared for him both medically and spiritually, especially through his later years in life.